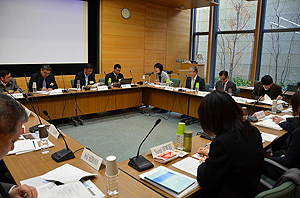 As part of the Project for International Contribution in Protection of Cultural Heritage (experts’ exchange) commissioned by the Agency for Cultural Affairs, Japan, officers from the Ministry of Culture of the Republic of the Union of Myanmar were invited to visit Japan from December 10 to 14. Invitees were 5 Ministry personnel specializing in archaeology, conservation, cultural anthropology, and fine arts such as U Thein Lwin, Deputy Director General of the Ministry’s Department of Archaeology, National Museum and Library. Invitees stayed in Tokyo and Nara, where they exchanged opinions with personnel at the Tokyo and the Nara Institutes, toured museums, and visited sites of archeological excavation as well as repair works of historical buildings. On December 11, a seminar entitled “Protection of Cultural Heritage in Myanmar: Current Situation and Issues” was held at the NRICPT’s seminar hall. Invitees delivered such presentations on archeological surveys, site preservation, and history and the current state of museums in Myanmar, sharing information by responding to questions from the audience. This invitation program provided the latest information on the protection of Myanmar’s cultural heritage and it fostered mutual understanding towards future cooperation. The same project plans to dispatch field study missions, in cooperation with the Nara Institute, in the 3 areas of architecture, art and crafts, and archaeology from the end of January to early February, in order to ascertain the direction of future Japanese cooperation in the protection of Myanmar’s cultural heritage.